A young IT expert/crimefighter finds herself multitasking between aiding a political campaign and aiding its security in the Batgirl #31. Writer Mairghread Scott continues a satisfying run on the title with the aid of penciler Paul Pelletier, inker Norm Rampmund and colorist Jordie Bellaire. The second part of the, “Old Enemies” story deepens the complexity of matters, as Batgirl and her alter ego Babs Gordon investigate the violence behind the scenes of a political campaign in the endlessly shadowy Gotham City. After an initial marginally cathartic encounter with a mucous-based super villain, Batgirl dives into intrigue involving a possible assassination attempt at a fundraiser for congressional hopeful Luciana Alejo. There’s a deadly villain calling himself the Cormorant who has been hired. 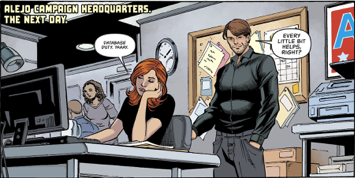 Batgirl’s investigation leads her to the campaign headquarters of Alejo’s rival Branson Moore. Scott’s scripting has a nice rhythm to it. The opening scene with the unnamed mucous villain is a clever way to deliver Batgirl’s chapter-opening, plot-reviewing internal monologue in a scene that also carries some visceral action. Little decisions like that make Scott’s work more engaging than the standard masked crimefighter adventure. While the election tampering milieu is topical, there’s very little here that is truly original to the long-lived street-level comic book superhero genre. Scott finds little ways of keeping it fresh enough to maintain interest from page to page. Pelletier manages weaves with Scott’s script back and forth between action and drama. Moments of heavy drama and investigation alternate with highly kinetic action. The drama is delivered in a very simple and crisp presentation. Pelletier’s delivery of the action has Batgirl very acrobatic. She’s jumping or getting thrown across the page in nearly every action sequence. Rampmund’s inking continues to cast shadows against the action. There’s plenty of room for the shadows to define the action. There are plenty of stylish silhouettes from the darkness and quite a few instances of characters looking down. Every time Batgirl or Cormorant or anyone else looks down, they’re thrown into a heavy dramatic shadow. Rampmund makes the lighting of the issue dramatic enough that this never feels like inadvertent self-parody. It all makes so much sense in and within the aesthetic of the issue. Babs’ red hair is the bright bit of colorful highlight throughout the issue. Red hair is very, very difficult to get right in the context of a traditional comic book, but Bellaire does a good job of keeping it as a powerful accent to all of the grays and blues and darkness without making it look silly and clown-like. Darker highlights against the light orangey-red keep Batgirl looking good. Bellaire also gets an opportunity to render quite a few bruises this issue. The gentle variation in coloration is respectably brought to the page. Of particular note here is Babs’ appearance back at the office after a tangle with the Cormorant. A close look at her face and you can almost even see where Ballaire has given life to the subtleties of Babs’ attempts to cover the bruises and cuts of battle with makeup. It’s a really close attention to detail that make a hero look that much more heroic without the mask. Scott and company aren’t reaching for something revolutionary with this story. It’s a solidly-produced earthbound crimefighter fiction with a badass heroine trying to aid in a fair election, which is admirable in the current political climate. Just enough of a mix of topical action and intrigue to make for an entertaining read.